Widget displays latest MacSanta deals. Is there a better alternative to MacSanta 2007 Tracker? Is MacSanta 2007 Tracker really the best app in MP3 category? Will MacSanta 2007 Tracker work good on macOS 10.13.4? MacSanta 2007 Tracker ... While it's a bit late in the season, here's an unofficial widget that displays the latest MacSanta 20% off deals (and the most recent 10% off extended discounts) offered by many great Mac developers. 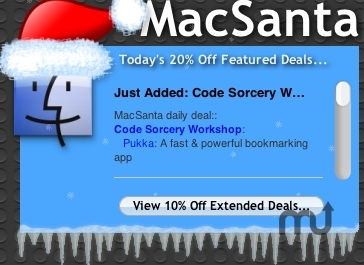 Each day until December 24, MacSanta features 20% off deals from various Mac developers. Don't worry if you missed your favorite developer's featured deal - you can still get 10% off every program that was listed on MacSanta through the end of December. Visit the MacSanta site for details. Mac OS X 10.3.9 or later (recommended). MacSanta 2007 Tracker needs a review. Be the first to review this app and get the discussion started! MacSanta 2007 Tracker needs a rating. Be the first to rate this app and get the discussion started! Featured developers include: Rogue Amoeba, Bare Bones Software, DEVONtechnologies, Red Sweater, Cocoatech, Fetch Softworks, Mariner Software, Astoundit Software (That's us), and so many more. Happy holidays to all! This widget uses the official MacSanta RSS feed available on their site at: http://www.macsantadeals.com.